Alkali bees, ground nesting bees, have evolved into effective pollinators of alfalfa flowers and have become the ideal choice for farms to rely on for pollination of the crop. This solitary species helps the alfalfa seed flourish, providing an economic boost to farm owners. These seeds can eventually be sold for growing hay for cows as well as other livestock, so they are often considered a great return in terms of investment. Even honey bees are outdone by these productive pollinators. 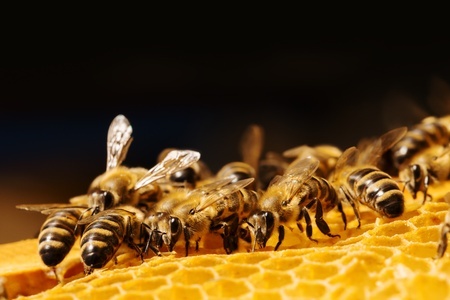 Alkali bees are known to pollinate at least 95 percent of the crops they visit. They forage for a variety of flowers, but they can survive on alfalfa flowers alone—so much so that most alfalfa farmers can rely solely on them to encourage alfalfa seed production. In 2015, entomologist Jim Cane spent a week in Walla Walla County, Washington collecting data from alfalfa fields he visited and studying the alkali bee. He saw how essential they were as pollinators, pointing out that “alkali bees from one acre of nesting bed—well populated—can readily pollinate 100 or more acres of alfalfa for a crop of about 100,000 pounds of clean seed.” After collecting data, Cane later studied the alkali bee’s nesting requirements in 2016 by measuring the flow of water vapor from surrounding soils around the bee’s brooding chambers and underground tunnels. The alkali bee prefers to nest in moist, alkaline soil, hence the name. They usually emerge from the soil in the late spring or the early summer. Female alkali bees build their nests on their own in a large area while males patrol the nesting sites nearby. Bee breeders often set aside one open field covered in salt with an irrigation system underground to maintain a comfortable habitat for them. Throughout the nesting area, at least 12 inches of the soil must be moist. The soil must be firm and compact for the female bees to begin nesting. The surface should also be completely bare. Plants and other vegetation use the soil moisture bees need for their environment. The goal is to provide enough moisture for larvae to survive without creating mold. According to Cane, larvae need a certain amount of moisture to not dry out while inside the brooding chambers. Females alkali bees feed on nectar and occasionally pollen, eating pollen often to gain enough fat and protein to produce their eggs. Cane’s research into this is actually the first to show nonsocial mother bees eating several pollen meals a day to produce eggs. After the female mates, she prepares a nest by digging a tunnel into the moist soil that’s at least 2-8 inches deep. She then divides the tunnel into branches to deposit her eggs and store pollen. Better understanding of these findings could assist alfalfa farmers in making sure they don’t overstock their bees and guide them in feeding alkali mothers while they wait on alfalfa to bloom.